This ice cleat (for a U.S. tank application) illustrates the possibilities available through metal castings. Conversion from a forging to a design taking advantage of the casting process reduced the lead-time delivery by 70%. An honest presentation of the advantages and limits of both steel component forms allows users to make informed choices when considering a forged or cast design. Much has been said and written recently by the forging industry about the advantages of forged products over castings. Such articles with headlines such as "Upgrade to Forgings" intend to imply that castings are in some way inferior and less reliable. It should be recognized that castings and forgings start from very similar beginnings and castings can have some very distinct advantages over other product forms, including forgings. 4. Perform first forging operation 6. Remove gates, risers, etc. Table 1 shows typical casting and forging procedures for producing a 10-in. valve. Although no two foundries are identical, all would essentially follow the same procedures identified in Table 1. For forging shops, however, two alternatives are possible: forging two halves and welding them together, or creating the internal channel from a solid billet by piercing and machining. Piercing consists of punching a hole through the piece. The hole then is tapered in shape, but may require extensive machining to bring it into tolerance. Although there is a substantial area of overlap, forgings tend to be used exclusively in some applications and castings in others. In determining which process to select, the crucial considerations are the ability to satisfy the design criteria and the ultimate cost of the component. In forging, metal is moved while it is still in the solid state. Because the forging billet is solid, substantial force is required to change its shape to the desired configuration. Because of this, the required force increases as section size increases. In practical terms, there is a limit on size and section thicknesses produced by forging. This doesnt mean that very heavy sections are never forged. But when they are, relatively little deformation or reduction in cross-section occurs. In other words, the surface of the part merely is moved from one place to another. In contrast, in the casting process the metal starts as a liquid and flows into the desired shape. Therefore, it is practical to cast components of large sizes and section thicknesses. For extremely large components, cast/weld construction is generally preferable to forged/weld construction. The reason is that fewer parts are typically involved, and because steel castings tend to have better weldability than steel forgings. In forging, solid metal is forced into the die cavity. In casting, liquid metal is poured into the mold cavity. Liquids can flow almost anywhere. Therefore, as complexity of shape increases, the practicality of forging decreases. Castings can accommodate great complexity of shape. The question of composition has two parts: what is obtainable from foundries and forging shops, and what is or isnt castable or forgeable? Forgings are produced from billets obtained from a steel mill and in compositions produced by the mill. Mills tend to produce limited grades of steel and special orders can be prohibitively expensive. Because steel foundries are more flexible, the number of chemical compositions obtainable from steel foundries is virtually unlimited. Although a single foundry cannot supply every conceivable alloy, it is always possible to obtain a unique composition to meet a unique requirement from a variety of foundries at lower cost than competitive product forms. The presence of controlled amounts of ferrite in certain stainless steels leads to increased corrosion resistance, higher crack resistance and better weldability. Ferrite occurs normally in most cast stainless steels, with the ferrite level controllable to produce the desired combination of characteristics. However, ferrite impairs hot working properties and is normally not present in forged components. The important class of work-hardenable steels also are not forgeable. Work-hardenable steels are generally high-manganese (approximately 13% Mn) alloys that become harder the more they are worked. Thus, they are ideal for dipper teeth, compactor feet and other earth-moving and excavation applications. Fig. 2. 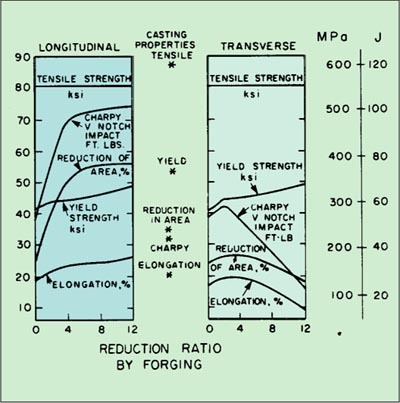 This figure illustrates the influence of forging reduction on anisotropy for a 0.35% carbon wrought steel. Properties for a 0.35% carbon cast steel are shown in the graph by a star (*) for purposes of comparison. Fig. 1. 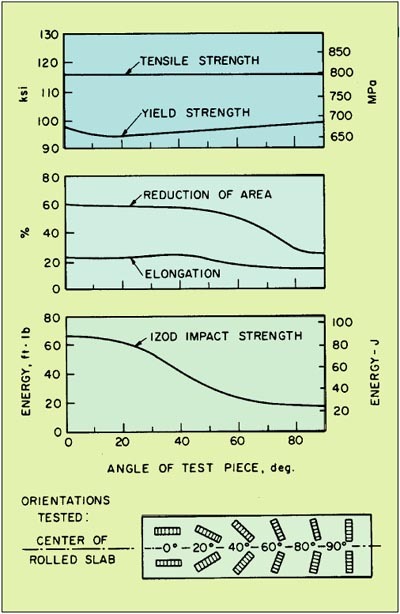 These graphs demonstrate the relation between the mechanical properties of rolled steel and the angle of inclination of the test specimen. The principal mechanical properties of interest to designers are strength, ductility and hardness. But how does the user know the mechanical characteristics of a part? For cast steel, it is relatively easy. If the component is made from a standard alloy, the characteristics are given in a standard specification. If it is made from any other alloy, standard foundry tests will provide the answers. The values will apply to that component regardless of the axis along which measurements were made. Many metal parts are made from rolled products like bars or plates. The rolling process changes the properties of the metal. The major advantage is that the strength is increased in the rolling direction or the longitudinal axis. Both forgings and fabrications have directional properties as a result of the rolling process. However, tensile strength, elongation and impact properties decrease in the transverse and axial directions. Thus, wrought steel and forgings in particular, are anisotropic (exhibiting different values of a property in different directions). For equivalent alloys, the ductility and impact strength of steel castings generally lie between the longitudinal and transverse values of forgings. In castings, the metal is isotropic, with similar properties in all directions (see Figs. 12). With respect to the mechanical characteristics of a forging, most forging references provide only longitudinal characteristics. To obtain the transverse or axial characteristics, the user will probably have to request them specifically. Additionally, the service conditions of the components must be carefully evaluated. If the loading is uni-axial along the longitudinal axis, then the directionality of the forging is an advantage. As the stresses increase in any other direction, directionality becomes a problem. Pressure vessels are good examples of applications where stresses are tri-axial. The design code (ANSI B16.34) used by most flow control manufacturers doesnt indicate that forged products offer any mechanical property advantage over cast products (Table 2). In terms of temperature extremes, corrosion resistance and wear resistance, "equivalent" castings and forgings generally perform equally well throughout the temperature range and are generally equally resistant to corrosion and wear. With regard to corrosion, however, cast stainless steels with controlled amounts of ferrite will probably be superior to their forged counterparts, since ferrite generally increases corrosion resistance. With regard to wear, work-hardenable steels can, for practical purposes, only be obtained as castings. Design and Design ModificationsAlthough castings and forgings have many design criteria in common (the need for generous radii, for example), each has its own recommended practices. When changing from one process to the other, the design should be reconsidered and new drawings made, or problems are likely to be encountered. A defect is a flaw in a component that is typical of a process, but not inevitable. As shown in the table, forgings and castings are each vulnerable to particular types of defects. Good casting practice and good forging practice can eliminate most of them. The modification of a design is a different matter. It is often necessary to alter a design by adding a rib or lug, removing a projection, etc. Here, castings provide a distinct advantage, since the modification of a casting pattern or corebox is relatively easy and inexpensive. But the modification of a forging die to accommodate even slight changes is usually difficult, very expensive and new dies may be necessary. The manufacturing process also places limitations on the shapes that can be produced. Often, foundries must explain to customers that to induce directional solidification and enable the pattern to be removed from the mold, it is necessary to introduce a taper of about 1.5°. According to the Forging Handbook, this magnitude of taper is typically 510 times greater in forged products. FabricationIf two components are to be welded together, it is advantageous to have one or both parts be steel castings. Castings are generally more weldable than "equivalent" forgings. This is true not only of austenitic grades of stainless steel with controlled ferrite, but of plain carbon and low-alloy steels as well. The superior weldability of steel castings was demonstrated in research performed by the Univ. of Tennessee. Five "equivalent" grades of low-alloy casting and forging steels were compared in terms of weldability, or resistance to cold cracking. Cold (or underbead) cracking occurs after the welded joint has cooled. This can be extremely troublesome since cracks are hidden beneath the weld and arent revealed by surface inspection. In the Univ. of Tennessee tests, cast and wrought grades of 8630 steel plus four other manganese-silicon (Mn-Si) grades were tested to determine the degree of preheating necessary to eliminate underbead cracking. For each grade, the cast steel required lower preheat temperatures than the wrought steel to achieve crack-free performance. Baseline tests to establish the weldability of the grades without preheating showed the same results. Every cast grade was superior to its wrought "equivalent." The problem with the wrought steels has been identified as the elongation of the inclusions. The needle-like inclusions in wrought steels appear to be more likely sites for crack initiation than the round inclusions in casting steels. Where welding is required, the same considerations apply as previously mentioned. At a given preheat temperature, welds on steel castings tend to be less susceptible to under-bead cracking than welds on steel forgings. Additionally, castings will achieve comparable weld reliability at lower preheat temperatures. Final CostsThe final cost of a part includes its purchase cost plus the cost of performing any necessary additional operations. Before assembly operations, for example, it is often necessary to machine the part to the desired shape. This cost can be considerable. When parts are relatively simple, castings and forgings tend to require equal amounts of machining. As parts become more complex, however, castings tend to require less machining. UpgradingThe forging process tends to reduce surface porosity and discontinuities (and may close up small internal cavities). Surface porosity and discontinuities occasionally appear on steel castings and require weld repair. The resultant surfaces meet the same standard requirements as the casting. The cost of this upgrading procedure is usually much less than the cost of additional machining typically required of forging. Size and WeightSteel castings are almost always lighter than their forged counterparts and the redesign from forgings to castings usually results in substantial weight savings. For example, a forged muzzle brake for a cannon anti-recoil system weighed more than 600 lb. The cast version weighed 400 lb and lasted more than three times longer. Set-Up and Production CostsThe key to the casting process is the pattern. The key to the forging process is the die. Pattern costs are substantially lower than die costs and can be amortized over shorter runs. With higher runs and with simple component configurations, forged components can become economically converted to equivalent castings. The CompetitionHow large is "large?" How complex is "complex?" When does a production run become "long?" These are the gray areas in which neither castings nor forgings show a clear-cut superiority. The solution for the designer is to determine the method of production before finalizing the design. A preliminary design will allow the customer to take advantage of the competitive situation. Invite bids from reputable foundries and forging shops and decide which process to use on a specific, case-by-case basis. The results may vary in different cases, but the competition can only serve to benefit the customer, user or purchaser. Clearly, steel castings have and will continue to maintain an important role in manufacturing. Their strength and ability to be produced to the shape required by designers should ensure that their competitive position will be maintained and improved. Designers and casting buyers can only obtain the real picture about either process performance by developing an open dialogue with their component suppliers. Both parties have the same interest in product design, quality and cost. This dialogue will ensure that the real problems will be identified and real solutions found. This article was presented in the Spring, 2000 edition of Engineered Casting Solutions.